Following figure illustrates a simple routing example. 10.0.0.0/8 Network is connected on router’s F0/1 interface. 20.0.0.0/8 Network is connected with router’s F0/2 interface. Laptop sends a packet to PC. Router receives this packet in F0/1 interface. Router checks destination address field in packet. Packet has 20.0.0.2/8 address in destination address field. IP address 20.0.0.2/8 belongs to 20.0.0.0/8 network. Router checks routing table for matching network. Routing table has an entry for 20.0.0.0/8 network. 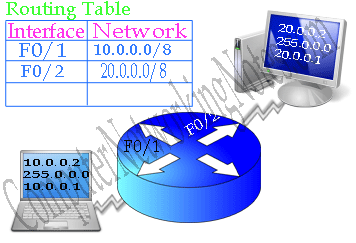 20.0.0.0/8 Network is associated with F0/2 interface of router. Based on this information router moves this packet from F0/1 to F0/2. F0/2 interface sends this packet to its destination. 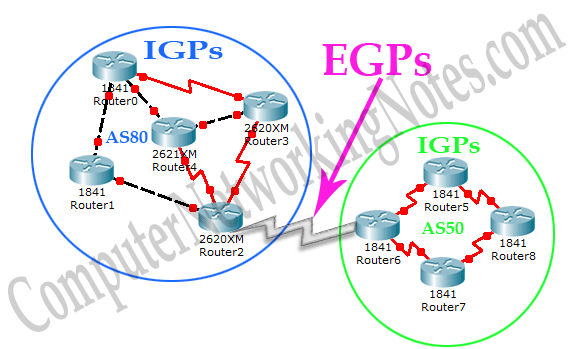 It is the easiest example of IP routing. In above example we used only one router to explain the process. In real life there could be several routers in the way of destination address. These routers may create certain path to the destination. Routing protocols insure that packet takes the best path from these paths. No additional configuration is required for directly connected networks. Router already knows how to get it. Such as in above example both networks 10.0.0.0/8 and 20.0.0.0/8 were directly connected to the router’s interfaces. Routers learn about remote networks from an administrator or from neighbor routers. Lower AD value is more believable by router. 0 is considered as the most trustworthiness network while 255 is considered as invalid route and it will be never used. All three types of protocol have their own advantage and disadvantage. They take different approach in sharing routing updates and in choosing the best path. In next articles of this section we will explain these protocols in details with examples.